By spring, and especially after four particularly wet winters in a row (but who’s counting, right? ), most of us are sick of water. But what if, rather than being grumpy about all the wet stuff, we decided to take an “if you can’t beat it, join it” approach and celebrate it? That was my thought when I planned a water-themed exploration along the Olympic Peninsula’s eastern edge. In springtime, all those mounds of snow in the high mountains above melt into dozens of streams racing toward Hood Canal, making for rumbling rapids and swollen waterfalls. Low elevation and an easy drive from Seattle make this a good place for exploring, especially when the weather is cool and cloudy. These hikes are both rewarding and relatively easy — which also makes them great for families with kids. 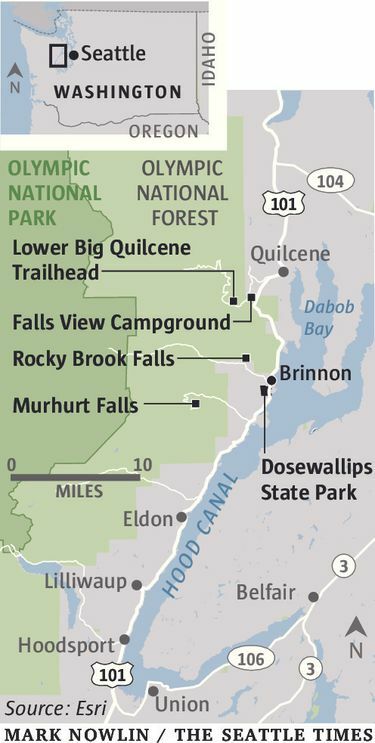 Reaching the trailheads for this tall, slender waterfall and 1.5-mile (round-trip) river hike requires parking outside the closed entrance gate to the Falls View campground and walking a short distance (stay to your left within the campground). The campground has been closed for a couple of years because tree-root damage threatens campsites. Recreation areas along Hood Canal are a mix of state and federal land, so bring the appropriate pass (Discover Pass for state parks, Northwest Forest Pass or federal interagency pass for Forest Service land). Dosewallips State Park’s RV and tent sites, as well as cabins and platform tents, are rentable year-round: parks.state.wa.us/499/Dosewallips. Sturdy, waterproof footwear is crucial in shoulder seasons when water could be anywhere — in the form of liquid, snow, slush or mud. Hiking poles can also be helpful. Watch for fast-moving water and keep pets and kids within reach. Check the Washington Trails Association website for more trip reports and directions: wta.org. Two trails leave from either side of an informational sign. The best view of the falls itself is from a very short walk to the right. I recommend first taking the trail on the left to explore the pretty river at the falls’ base and saving the waterfall view for last. The river trail drops down fairly steep switchbacks but then levels off when it reaches a pool where three rivers converge near the bottom of the falls. From there, a more level path follows the river and then loops back along the hillside. Off Highway 101 four miles south of Quilcene. More info: st.news/WTA1. A quick stop if you’re in the area, Rocky Brook Falls, 3 miles off Highway 101, north of Dosewallips State Park, packs a big bang for your hiking buck. Just a 5-minute walk from Dosewallips Road on level ground, this massive waterfall is at its most magnificent in spring. As we awaited our turn to clamber up the last little bit of trail and stand by the pool at the base of the falls, I chatted with Kelly Shea, of Shelton. She’d heard about this waterfall, but “I didn’t expect it to be this big. I was surprised,” she said. She and her husband, Tom, typically do longer, more strenuous hikes in the area. But we agreed that the waterfalls are a fine substitute while many of those are still inaccessible. Just south of Brinnon on Highway 101, amenity-rich Dosewallips State Park, open year-round, is the starting point for this loop. With abundant picnic areas and clean bathrooms, it’s also a great lunchtime spot; I opted for a very satisfying sandwich from Gearhead Deli in Quilcene. From its beginning near the park’s platform tents, the trail follows the blue-green Dosewallips River for a short time before heading uphill. There, we encountered beautiful small cascades that will likely be nonexistent by summer. The undulating trail also passes some of the biggest stumps and snags you’ll ever see. While the Washington Trails Association website describes this as a 1.5-mile hike, most people cross the service road at its midpoint to connect with the Steam Donkey Trail, named for machines that dragged logs through the forest in the old days. It leads downhill back into the campground and past a mill pond for a hike that’s closer to 3.5 miles. Given all the water nearby, this one can get muddy in spots, but there are bridges at all stream crossings. Keep an eye out for elk and eagles. 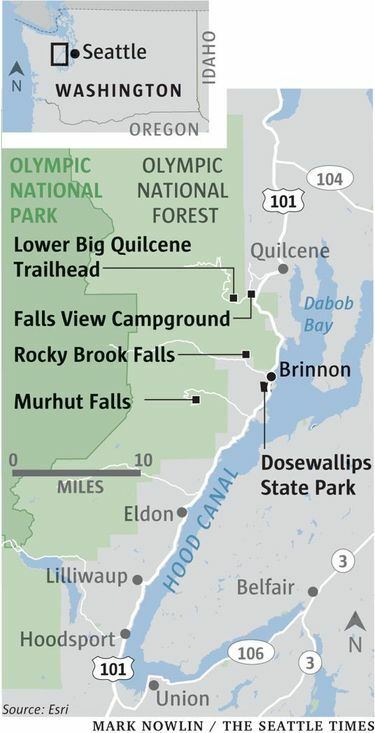 We saw almost no one at the Falls View or Dosewallips trails, but this 1.6-mile (round-trip) hike is popular year-round — for those who can make it past the many potholes on the last few miles of the drive to it. We saw a Volkswagen Beetle at the trailhead, and our new friends the Sheas were there, too, having made it up in their Toyota sedan. The hike itself is very well maintained and snag-free, with a moderate and gradual elevation gain. 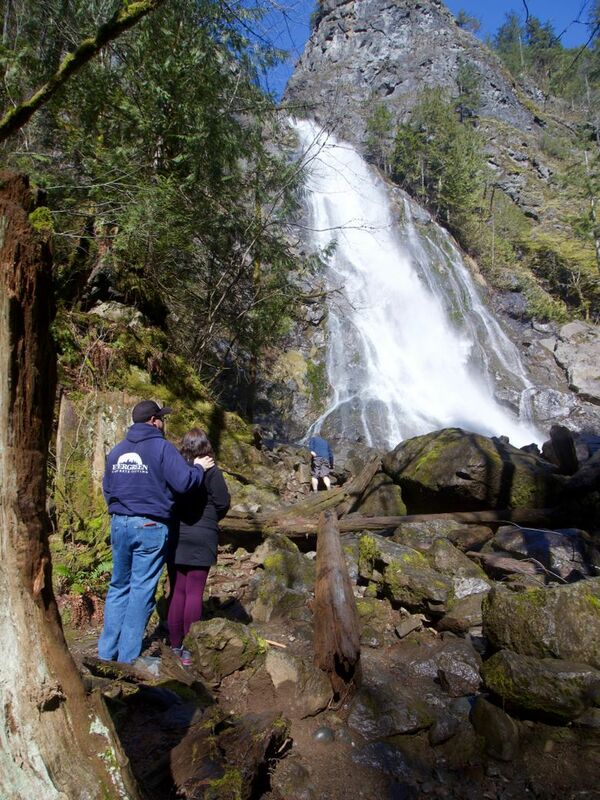 Tucked into lush greenery and tall trees, the multitiered falls are among the prettiest in the area. From U.S. 101 south of Quilcene, turn west at Milepost 310 onto Duckabush Road. More info: st.news/WTA4. Ranger Hole: To skip the pothole-filled road to Murhut Falls, take this hike below it, which follows a rushing blue-tinted river for a satisfying and mostly flat 2.1 miles round-trip. st.news/WTA5. Lower Big Quilcene River: This trail consistently follows the river, with its pleasing music always audible. The entire trail is quite a few miles long, but you can turn around anytime, possibly at Bark Shanty Camp, 2.7 miles in. Be prepared for wet sections in spring. st.news/WTA6. Big Creek: With an elevation topping out around 1,800 feet, this 4.3-mile loop may have snow a bit longer than other lower-elevation options, especially after cold, wet weather. The well-maintained trail crosses the creek a few times via sturdy bridges. st.news/WTA7.